"Choose your game. And if you lose, you will stay here in hell forever…" This is totally bogus! FilmStruck and the Criterion Channel have debuted a wacky, crazy, fun new trailer for their fantastic "Friday Night Double Feature" - Ingmar Bergman's The Seventh Seal (1957) with Peter Hewitt's Bill & Ted's Bogus Journey (1991). For those who have seen the Bill & Ted sequel, there's a big part in the middle of it where they get stuck in hell (after being killed by evil robot versions of themselves) that is an homage to the chess scene in The Seventh Seal, where a medieval knight plays against Death. It's a iconic part of Bill & Ted, so FilmStruck decided to pair these two as a double feature - and it's a match made in heaven hell. This video combines the two movies and it's totally rad. As a big fan of Bill & Ted, I couldn't help featuring this trailer. Description from FilmStruck: There's no more fearsome opponent than the Grim Reaper, no matter what the game. 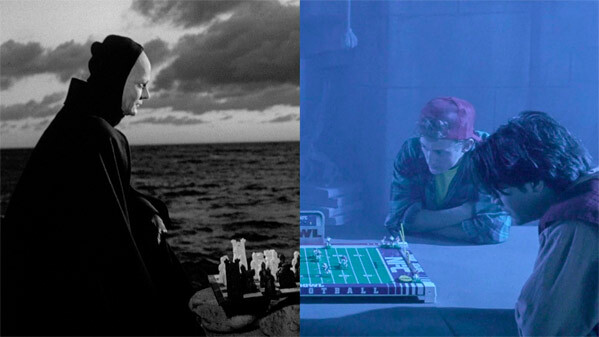 In Ingmar Bergman's The Seventh Seal, one of the most iconic art-house films of the 1950s, a medieval knight (Max von Sydow) challenges the hooded figure of Death to a round of chess, setting off a profound inquiry into the nature of mortality and faith. Sending up Bergman's film, Peter Hewitt's 1991 comedy Bill & Ted's Bogus Journey-a sequel to Bill & Ted's Excellent Adventure-follows its two slacker protagonists (Keanu Reeves and Alex Winter) to hell, where they face off with Death in Battleship, Clue, and Twister, learning along the way that he's a very sore loser. These two films will premiere as a "Friday Night Double Feature" on the Criterion Channel, as part of the celebration of Ingmar Bergman's centennial with a series of Bergman inspired double features. For more info, visit FilmStruck or see Criterion Channel.